Public objective facts. We use two types of data: objective end-of-day facts for US exchange traded equities and ETFs from a public free or subscription provider (such as Google, Yahoo, Reuters, Bloomberg) and objective fundamentals (for example capitalization or price-earnings ratio) from a public free or subscription provider (such as Google, American Association of Individual Investors, or CapitalIQ). We also use IPO information from the SEC, and announcements of recent mergers and acquisitions. We do not use "news, opinion or analysis." During development of the ZZAlpha® machine learning technique, the technique was tuned based exclusively on portions of 2008 data. All other results are out-of-sample, forward looking testing. b) We have assembled results across 42 different market segments, and across 8 different portfolio sizes (up to 50 long and 50 short). The results are robust in spite of the differences of broad market behavior in those years and the differences among the market segments tested. Yes and no. Internet discount retail brokerages such as Fidelity or TDAmeritrade currently charge $5-$10 for a trade, which is a relatively insignificant cost for professional investors. As of 2017, some brokerages offered free trades. We assume $5. Institutional investors may have lower costs of under $0.005 per share. Use of a limit order controls slippage. We have modeled the effect of commissions and found that as assets under management grow beyond $50,000, the appropriate discount commissions decline to relative insignificance. 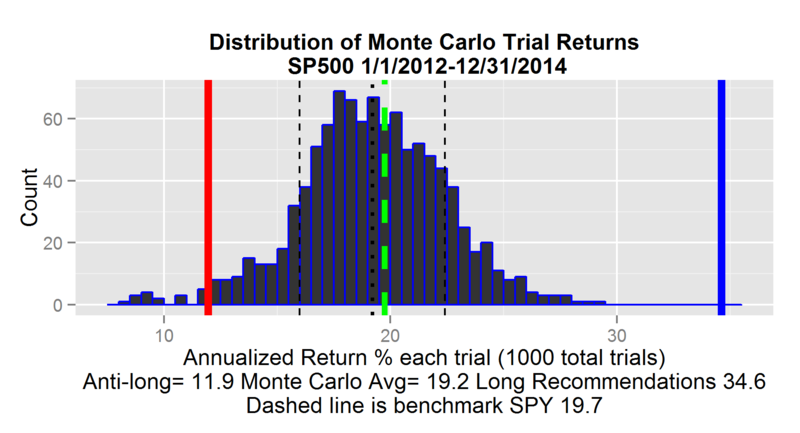 However, the results shown on newsletters do not include trading costs. Yes. We evaluate using an "anti-long"methodology which evaluates what occurs when short recommendations are "erroneously" treated as buys. This avoids the true market limitations on availability of short shares under different circumstances, and the lack of uniform practice on calculating percentage returns on short transactions..
a) Bad data - Occasionally, public data suppliers such as Reuters, supply incorrect information about equities. Although we use techniques to validate arriving data every day, sometimes current recommendations will be based on some bad data. Our historic results usually have the benefit of any subsequent corrections by the data suppliers. b) Turn risk - The world can change overnight. The ZZAlpha® machine learning technique typically "believes" that tomorrow will be a lot like today and a lot like the past. It can take a few days before the ZZAlpha® engine learns about and reacts to a new economic environment. In the interim, until the model "turns course," the ZZAlpha® recommendations may give poor results. No, with a nuance. For each historical week of forward testing we use a list of stocks that were actually trading on NYSE, AMEX or NASDAQ at the start of that week, regardless of whether they still exist today and are traded on the exchanges today. Companies from years ago may have gone out of business, merged, changed their name, or trade now as penny stocks and we now know are not "survivors." When we forward test, we use only information that was actually available before trading on that historical day of the test. Yes. For validation, for understanding quirks of real-time market trading, for testing, and for profit, the founder invests in various recommendation portfolios. His return (after commissions and trading costs) in 2012 to date were more than 50% more than the S&P 500.